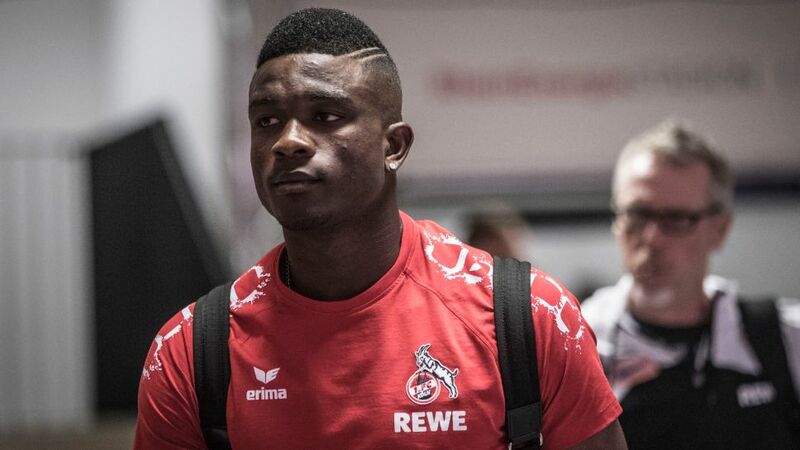 Bundesliga | Cologne's Jhon Cordoba: "Prove it against Arsenal!" Cologne's Jhon Cordoba: "Prove it against Arsenal!" Cologne are back in European competition for the first time in 25 years, and after drawing Arsenal in the UEFA Europa League group stages, Jhon Cordoba - the club's record signing - can't wait to get started. bundesliga.com: Jhon Cordoba, Cologne's game against Arsenal is sure to be the high point in the Europa League group stage. How did it feel to draw them in Group H? Cordoba: It's a beautiful match. Everyone wants to play against big teams and in Arsenal we have a strong opponent. But we're also a good team and we'll prove it. bundesliga.com: You're Cologne's record signing and comparisons with Modeste [last season's 25-goal top scorer] are unavoidable. How does a young player like you handle that? Cordoba: I'm used to it. I was also Mainz's record signing and everything went very well there. Modeste had a great season here and it's inevitable that people will compare us, but I came here to work. Cologne signed me because they know my attributes and what I can do on the pitch. I've had that confidence from day one and I want to show why they brought me here. Watch: The Top 5 Colombian goals in the Bundesliga, including Cordoba's stunner against Bayern from 1:10! bundesliga.com: Is the move from Mainz to Cologne a step up in your career? Cordoba: Yes. Historically, Cologne have been a great team [The Billy Goats won the league in 1978 and were runners up as recently as 1990]. It's a team with tradition and with wonderful support from the fans. As well as that, the coaching staff and the vision they have for the direction of the club are what motivated me to come here. Cordoba: James brings quality. Lots of quality! When he's feeling good he's very skillful and contributes important things to his team. German football will be more widely seen in Colombia now. Before, I was the only one here. It's very positive that such a player has arrived and hopefully it will open the door for more players to follow suit. bundesliga.com: Do you think you will join James on the plane to Russia for the World Cup next summer? Cordoba: Every player wants to play for their national team. I've not been given the chance yet, but I'm working well with my clubmates to seize the moment when it arrives. I've been doing things well in the Bundesliga. bundesliga.com: How is the Bundesliga viewed in Colombia? Cordoba: It's one of the most competitive leagues in the world, the best. It's very well respected in Colombia. bundesliga.com: In terms of the football, what are the main differences between the Bundesliga and other leagues you've played in, like Colombia, Mexico and Spain? Cordoba: They're totally different leagues. In the Bundesliga you run a lot. It's very active, there's no time to rest, and you attack and defend more within a single game. That's the biggest difference. In Spain, it's a little more tactical, in Mexico, the ball is in the air a lot and in Colombia, there's more time. bundesliga.com: James wasn't the only South American to come to Germany this summer, with Argentina striker Lucas Alario joining Bayer Leverkusen and Venezuela forward Sergio Cordova at Augsburg. What's the best advice you can give them about adapting to the Bundesliga? Cordoba: Experience it, live and breathe this beautiful experience. If they do things well, the fans are going to love them very much. bundesliga.com: You were just a baby when Adolfo Valencia came to Bayern in 1993. "El Tren" [The Train] won the league that year and was Bayern's top scorer. Can you do something similar? Cordoba: As a player, I always dream about that! I dream of scoring goals and being a champion. We know that there is stiff competition, but nothing is impossible. bundesliga.com: What are your specific goals for this season? Cordoba: I have many. To score lots of goals, that's my goal (laughs)!